There shall be created the Order of the White Scarf of Lochac. The members thereof shall have demonstrated high achievement and service to the Kingdom in civilian (rapier) combat. Further, they shall have demonstrated chivalry, courtesy and those aspects of courtly behaviour and accomplishment expected of any Peer of Lochac. Companions of the Order shall be entitled to wear a white scarf about the left shoulder or tied above the left elbow. With the founding of the Kingdom, Lochac became a signatory to the Knowne Worlde White Scarf Treaty and thus founded the Order of the White Scarf of Lochac on 6th of July, AS XXXVII (2002). The Premier members of the Order were elevated at the first Lochac Coronation. With the Society wide foundation of a Peerage for Fencing, that being the Order of Defence, the Order of the White Scarf of Lochac was closed, and the members that had been inducted were to thus remain in high regard throughout the Kingdom for the work they had done up to that point. It was this work by the OWLs that showed the Kingdom and Known World what a fencing peerage would look like, and the necessity for this Peerage. At the time of it's closure on 2nd of May, AS L (2015) there had been 26 members inducted into the Order. The Order of the White Scarf of Lochac built on a long and glorious history first established in Ansteorra. To understand our history is to also make some understanding of our place in the Society. The Order of the White Scarf was originally created as an award in the Principality of Ansteorra in March of A.S. XIII (1979). It was intended to provide recognition for excellence in the growing population of rapier fighters in the principality. When Ansteorra became a kingdom in May of A.S. XIV, the order was released from the parent kingdom of Atenveldt to Ansteorra for its continued use. At that time there were some 40 or 50 rapier fighters in Ansteorra, and a few handfuls scattered throughout the rest of the Known World. In the Renaissance a white scarf was worn as a badge of military rank. The only picture I've ever seen shows it worn as a baldric, left shoulder to right hip. Obviously this would be unacceptable in an SCA context, so a much smaller version, worn only about the shoulder, was designed. (Cyrano de Bergerac was the source of the original idea.) 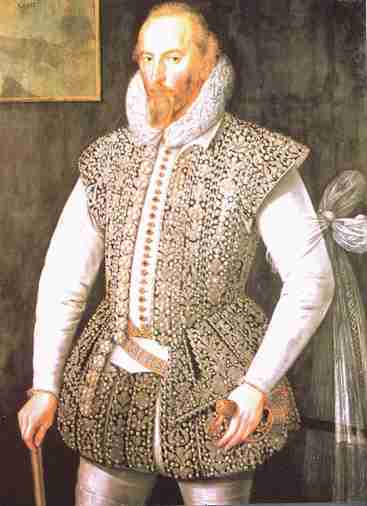 There is also a picture of Sir Walter Raleigh wearing a white scarf tied just above his left elbow (see below). I'm not sure if this was also a military badge, or if it is a lady's favor, but the style of wearing White Scarves in this fashion is becoming more common. The Order continued to add new members as the rapier community in Ansteorra grew. It became traditional for the Crown to hold meetings with the Order to discuss potential new members, as well as issues of general interest to the rapier community, such as rules changes or inter-kingdom events. The Crown is not required to hold these meetings, or to take any action based on the opinions expressed there, but they generally do. (The Ansteorran Crown has granted their Order of the White Scarf the Right of Consultation, which requires the Crown to consult with the order, but it is still not obligated to take any action based on that consultation). It is also traditional for the White Scarves in particular, and the rapier community as a whole, to look to the Queen much more than to the King. This is based partly on the fact that several prominent members of the White Scarves have Elizabethan personas, and partly on a "Three Musketeers" flavor from the days when the general belief was that the SCA's time period extended to 1650. The Queen's Champion in Ansteorra is traditionally decided by a rapier list; most of the other kingdoms that have rapier combat also have a Queen's Rapier Champion, or something similar. In October of A.S. XXI (1987), the kingdom of the Outlands signed a treaty with Ansteorra to create their own Order of the White Scarf. Since that time, there have been some 30 or 40 members added. In the Spring of A.S. XXVII (1994), Atenveldt and An Tir also joined the White Scarf treaty. Their addition to the treaty was done entirely by mail; previously, the groundwork had been done by mail, but the actual signing was done at an interkingdom event. In this case, there wasn't an interkingdom event conveniently available (Estrella war having just passed, and Pennsic being several months away), so it was decided not to wait. In June of AS L (2015)the new kingdom of Avacal joined the White Scarf Treaty. Last updated on 2 May 2017, 1:37:34.